They need to DO something with Apollo’s character. Give him a better (read: does not involve pining for Starbuck) storyline, one where he finds his niche on the series. 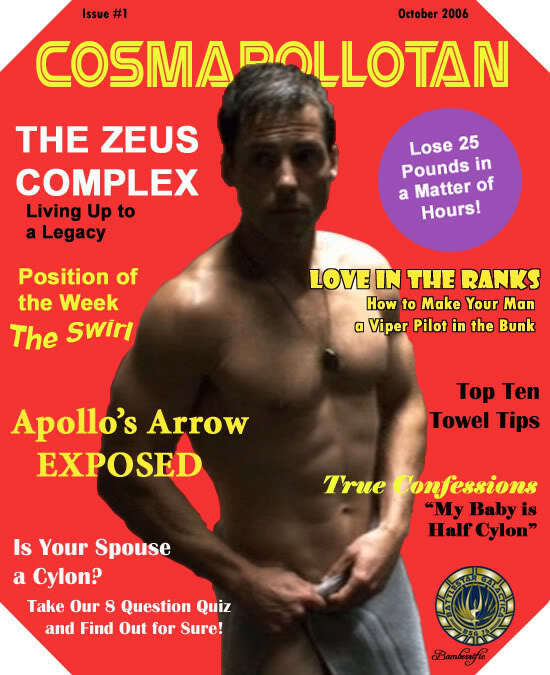 Another thing that I’d love to see is the writers delving into the Adama-Apollo relationship a little more. Show us some father-son angst, maybe? I don’t know… anything that what they’re currently doing with the character! [this is good] The relationship he had with his brother was barely touched upon, as well as his relationship with his father in relation to his brother (since his brother’s death). They could easily get some mileage out of that! Or hell, maybe throw in a kid he didn’t know he fathered. Or Dualla gets pregnant & Apollo buckles down to be a good husband & father, and then she dies in childbirth. Anything!!! Much as the Starbuck-Apollo love thing enchanted me at first, it’s just gotten tedious now. I really like the idea of exploring his brother’s death– lots of potential material there. In general I think the Adama family tree is chock-full of juicy plot avenues to explore!